Our only specimens are from a wooded bluff along the Ohio River about 6 miles above Cannelton and from a wooded bluff in Jefferson County. I reported Oxalis Brittoniae Small from Steuben and Wells Counties. (Proc. Indiana Acad. Sci. 1904: 220. 1905.) I am now referring these specimens to Oxalis europaea Jordan. Pepoon reported Oxalis filipes Small from Lake and Porter Counties for Umbach but Fassett (Rhodora 35: 200. 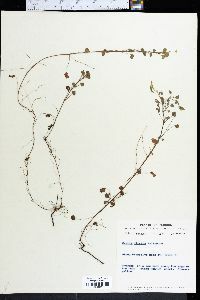 1933) refers the Lake County specimen to Oxalis stricta and says there is no specimen labeled Oxalis filipes from Porter County.